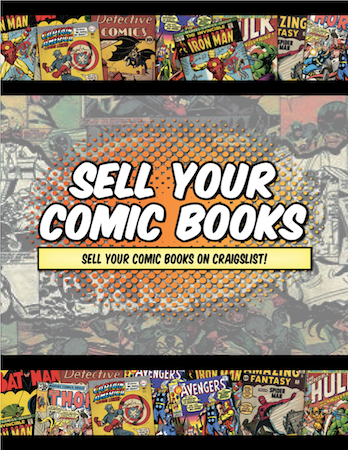 Do You Want to Unlock the Secrets of How to Sell Comics on Craigslist? eBay is not for everybody, and not every collection is worth the trouble, either. 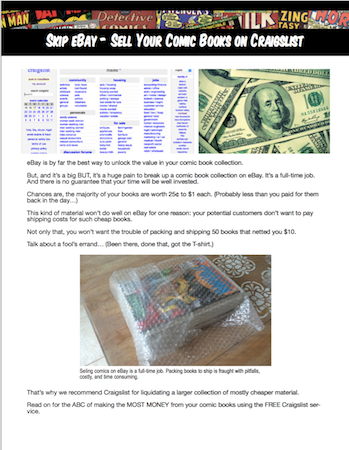 We have laid out for you a simple guide to how to max out the money you make by selling your comics on Craigslist. 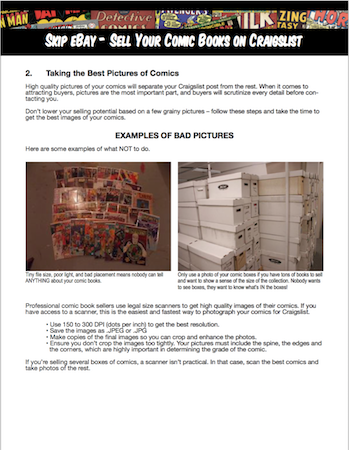 Ten copy-and-paste templates to fancy up your listing, and make people WANT your comics! If you've never used Craigslist, it's a bit old-fashioned and hard to use. BIG TIP: Don't Let Buyers Cherry-Pick! I sold my comics on the first day. No shipping, not eBay fees, no Paypal, no BS. I read the book and immediately put the comics on Craigslist. I didn't REALLY feel comfortable using the "wife wants them gone" method, but it works! Use Our FREE Custom Templates to Sell Your Comics FAST! These are all tried-and-tested. Craigslist still uses a language called HTML. Don't worry if you don't know it -- we include ten HTML templates. You just copy and paste. Some are not for everybody. Not everybody wants to spin a yarn. That's okay. We provide "vanilla" templates too! We show you good and bad examples -- taken from REAL Craigslist listings! Stop wasting time. GET THEM GONE in hours! I just finished reading the eBook you wrote and it's good value. Some good tips and advice. Wish I had read this book before I sold my record collection. Will use this for selling my comic books on Craigslist for sure. 1) How Soon Will I Receive my eBook? We will email it to you immediately after you finish checkout. The email will come from E-Junkie.com. Didn't get your email? Check your junk or spam folders first, then contact us via email and we'll figure it out. You need to unpack the ZIP file. Your PC will do this for you automatically. 2) How Do I Use the Templates? 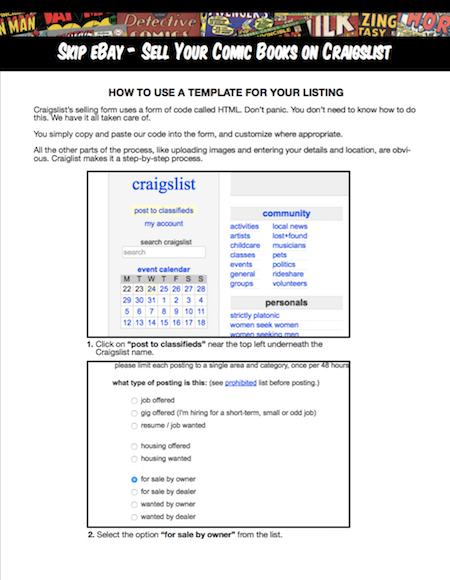 Select the entire contents of a template and paste into the Craigslist form. 3) Is This REALLY Worth $7? We have sold lots of large comic book bundles using Craigslist. It's tried and tested. You will save yourself $7 by NOT wasting your time doing Google research. This eBook will pay for itself very quickly! 4) What if I am Not Satisfied With My Purchase? We will refund your money for any reason up to 365 days. Alternatively you can offset the refund against any of our other products. "Easy to use and written plainly." Who is The Comic Book Insider?